Photographer Eric Luke’s book is nominated in the Irish Book Awards. THE CHANGING FACES of Ireland are captured and examined in Eric Luke’s new photography collection Looking Back, which brings us images of Irish life across four decades. Dublin-born Luke joined the Irish Press Group as a staff photographer in 1973, after a brief stint working in the darkrooms as a photographic printer. In 1990 he moved to the Irish Times and began covering major news and feature stories both at home and abroad, including World Cups, Olympic Games, and assignments in Somalia, Kenya, India, Sydney, Washington and London. He has won a World Press Photo News Award and PPAI Photographer of the Year during his long career. He’s now compiled some of his favourite photos of Ireland in Looking Back: The Changing Faces of Ireland, which is nominated in the Best Irish Published Book section of the Bord Gáis Energy Irish Book Awards, sponsored by TheJournal.ie. Here, Luke has given our readers an insight into the background behind some of his best photos. “Right next door to our old Irish Press office on Poolbeg Street was the shop of Sam Greer, the last saddle and harness maker in Dublin. 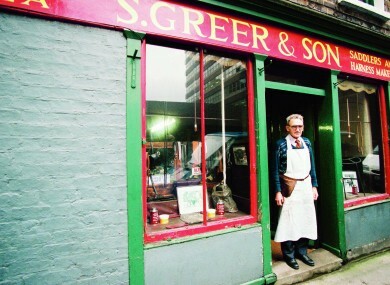 His grandfather, also Sam Greer, started the business in 1900. Horse owners from as far afield as the Aran Islands came to him for saddles, as the quality of his work was renowned. Greer’s saddles are still highly valued for their hand stitching and fine craftsmanship. “We would occasionally drop into him, and he would repair one of our leather camera bags, or make a new one from scratch if he had time. “Another wonderful institution that is now long gone – the local barbershop, Dom McClure’s in Castle Street, Dalkey. Growing up in the area, my mother would frog-march me to the barber’s for a short back and sides. This meant a short journey to Pip Connolly’s in Glasthule or McClure’s in Dalkey. “I was dispatched by the Irish Times to photograph artist Finola Graham at her home in County Clare in February 2000, as she had an exhibition due to be launched. On arrival, she told me that her husband, the writer Francis Stuart, had just died, at 97. I assisted in laying out the famous writer, and asked for permission to photograph him before the wake. “In the old Carlton cinema, opposite the Gresham Hotel in O’Connell Street, Dublin, the great blues guitarist Rory Gallagher took the stage in 1975. When Rory, on a tour of Ireland, appeared on stage, the hair (I had hair then) stood up on the back of my neck. I desperately attempted to follow him with my manual focus and manual exposure, as he charged around the stage. “One of my earliest pictures for the Press group, and my first State occasion to photograph, was of the inauguration of President Patrick Hillery for his first term of office, in 1976. Photos by Eric Luke. Looking Back: The Changing Faces of Ireland by Eric Luke, published by The O’Brien Press 2016, is available from all good bookshops now, priced €24.99. The book is nominated in the Best Irish Published Book section of the Bord Gáis Energy Irish Book Awards. To take part in the public voting, visit the official website. Email “Life, death and rock n'roll: 40 years of Ireland captured in photos”. Feedback on “Life, death and rock n'roll: 40 years of Ireland captured in photos”.